Across the corporate landscape, our silo-based cultures tend to force dialog along the chain of command. Look at your work emails. Instructions and permission are top-down. Ideas have to move up and down the chain. You see these patterns every day. What will it take to change the rules? Can ideas and information flow seamlessly across silos? This is a timely topic for the #futureofwork. Open communication is critical for shaping change. Ideas are all around us. We don’t need to wait for holacratic, flat, or teal frameworks to start having the important discussions that lead to new thinking. What are some key roles required to spark and sustain cross-functional conversations? In my book, I introduce 12 collaborative roles (with definitions posted here). Food for thought. But there’s much more to the puzzle: how do these roles interact? Much depends on group size, focus, skill sets and mindsets. Holding context can be a challenge. And that’s quite a bit to juggle. Part of the magic in collaboration is creating visibility to the core elements for success, and keeping that model in view. Exploring 12 Key Roles for Foster Dialog. Sparking and sustaining cross-functional conversations can require many roles. Contributors often play many at once, without realizing it. 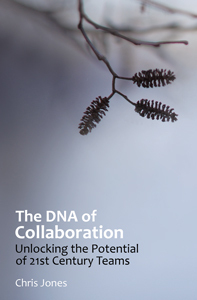 Adapted from The DNA of Collaboration (2012), Ch. 14, Fig. 20. Q: How do Roles like these transform the nature of dialog in the modern organization? What is their unique power, and how do they work together? Our regulars know a normal #orgdna Twitter chat has 4-6 questions, which often come too fast to process. We’re going to slow that pace down a bit, as we seek to drive deeper insights, and more critical thinking. Let’s do this. Join us for the live chat Monday, 3/26 at 9 pm ET. Additional details for the chat appear below. It should be a great conversation, about fostering .. better conversations. I hope you’ll join us. ABOUT THE GROUP. Since 2012, a self-selecting band of OD thinkers has been discussing the future of the organization, using hashtag #orgdna. The group continues to evolve, with 20-25 active contributors. ABOUT THE TWITTER CHAT. On any given month, 5-10 of us come together on Twitter for conversation, which is open to all. For the chat itself, we recommend a tweet streaming app like TweetDeck. Just add #orgdna to your tweets, and we’ll start to exchange ideas at the appointed hour. We’re now running 2-hours to accommodate time zones; just join for any part that you’re able. ABOUT THE TOPIC. Much is being said on “the future of work” and its unfolding dimensions. See Deloitte’s Tom Friedman interview, Use #futureofwork in your tweets for additional cross-over engagement. ABOUT THE AUTHOR. Chris Jones is a thinker, instigator, and explorer of edges, unpacking the forces inside organizations for over 30 years. Look for more here on the #orgdna blog, on Medium – or for the deepest dive to date, over on Amazon.